Star formation is commonplace — after all, stars are everywhere. From galactic scales all the way down to the solar neighborhood, stars make up much of the visible Universe. So it may come as a surprise that star formation is actually remarkably inefficient. To understand what I mean, you have to appreciate how stars form. Our basic picture of star formation starts with a molecular cloud which collapses under it’s own self-gravity. In this scenario there are two basic forces: the inward pull of gravity, and outward gas pressure. When gravity wins, which it will if the cloud is massive enough, the cloud begins to fragment. When the cloud reaches high enough densities, stars will begin to form. However, observational studies of nearby star forming regions suggest only 3-6% of the mass of the parent molecular cloud will form stars over the gravitational free-fall time of the cloud (Evans et al. 2009). The observed star formation efficiency indicates that self-gravity and pressure are not the only forces in play for molecular clouds. Other culprits include internal turbulence of the cloud, radiative feedback from newly formed stars, and magnetic fields. 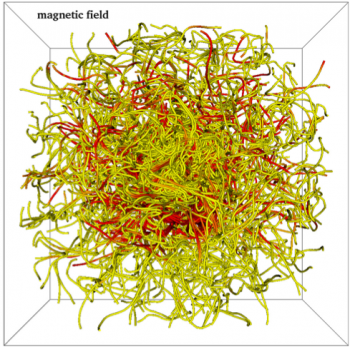 Today’s post focuses specifically on how magnetic fields affect star formation. Magnetic fields are important because they can mediate star formation by providing support against collapse for dense molecular clouds. Boss & Keiser approach this problem using the code Enzo 2.0. Enzo 2.0 is a widely used parallel code which uses adaptive mesh refinement and performs ideal magnetohydrodynamics. Adaptive Mesh Refinement (AMR): The length scales required to model star formation span many orders of magnitude. Giant molecular clouds are measured on parsec scales (1 pc ~ 3 x 1013 km) whereas the radius of the sun is ~ 7 x 105 km. So modeling the collapse of a molecular cloud all the way to star formation requires a code which can span 8 orders of magnitude! AMR works by starting with a coarse grid, and inserting new grid points points when they are needed to trace small scale physics, and removing the grid points when they are no longer needed. This cuts down on memory usage and computing time. Magnetohydrodynamics is a combination of fluid dynamics (hydro-) and electricity and magnetism (magneto-). A molecular cloud is a fluid which can be described by the Navier-Stokes Equations. This set of equations traces how energy, momentum, and mass is conserved in a fluid in terms of thermodynamic quantities such as pressure, temperature, and density, as well as the velocity of the material. Furthermore, magnetohydrodynamics invokes Maxwell’s Equations to trace the interplay of currents and magnetic fields in a conductive fluid. Enzo 2.0 is overrun with complicated physics. As a result, this code can model many complicated processes, but it is crucial to first verify that the code can reproduce known results with simpler physics. Boss & Keiser go about this self-check by testing the code on a classical star formation case: the collapse of a non-magnetic, isothermal cloud model. Many researchers have verified that when a large density perturbation (50%) is introduced into a 1 solar mass cloud, the material collapses into not just one star, but a binary system. Boss & Keiser reproduce this result, thus they can proceed to the magnetic case. Boss & Keiser figure 4. 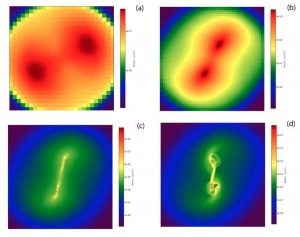 This figure shows the density evolution (from a to d) of a molecular cloud as it collapses. This cloud had a small initial field along the direction of rotation of the spherical isothermal cloud. The magnetic field prevents collapse as early as it occurs in the non-magnetic case, but the system eventually forms two long filiments (panel c) which collapse into a binary system (panel d). The cloud begins to collapse, and increases significantly in density; however, the magnetic fields prevents complete collapse of the cloud, thus it doesn’t form stars. The cloud collapses and fragments forming multiple protostars with multiple spiral arms. This scenario is shown in the figure to the left. Even with this simple model, Boss & Keiser confirm that both magnetic field direction and strength are important in determining the outcome of a molecular cloud. This had already been established with “pseudo-MHD codes”, which are faster than true MHD codes, but the results of these “pseudo-MHD codes” need to be verified with more detailed calculations such as those presented in this paper. In the future, researchers can use Enzo 2.0 to study more complicated star formation structures such as oblate and prolate clouds which better resemble observed molecular clouds. I am currently a first year graduate student at UCLA. I work with Andrea Ghez to study the dynamics of the old stars in the Galactic Center. Last year, I earned a M.Phil (Master of Philosophy) in astronomy at the University of Cambridge. While there, I studied the (theoretical) progenitors of electron capture supernovae with Chris Tout. I completed my undergraduate degree at Butler University where I studied the dynamics of galactic nuclei with Brian Murphy. Energy is only a property of things. It is a very abstract human mathematical CONCEPT only with no existence in physical reality.